Coming from how storytelling is a way to educate the community, Ade Putri Paramadita shares a new perspective in reviewing foods and drinks. 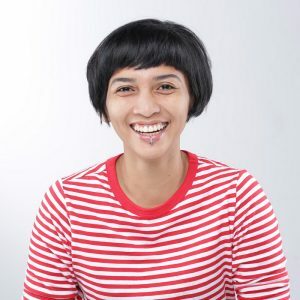 At a time when people are rushing to become food bloggers, Ade Putri Paramadita, founder of Beergembira.com, in fact refuses to be called one. Because what she’s writing is more than food reviews, but also about the immensely rich stories behind every flavors. We met Mbak Ade Putri to discuss coffee storytelling, trends, and her suggestions for young people who are starting coffee business. How do you write stories about food or drink? Reviewing food is easier because there are many things to explore. But this is not the case with drinks! Drinks have fewer ingredients to explore in a longer form of writing. So I have to find my own way to keep the story interesting. Usually, I’ll begin with the character of the drinks. For instance, coffee. I will describe the flavors of the coffee with the simplest words, then explaining the meals that’d be perfectly paired with it. This way, readers who aren’t coffee drinkers will be enticed to learn more. Read this article (in Indonesian) on coffee beer by Beergembira. When we tell a story about food or drink, we should look for taste profiles that readers might be interested in. Tell me about your experience reviewing coffee for the first time. Honestly, I was not a coffee drinker at all. Every time I was at a coffee shop, I ordered Frappuccino. My first cupping experience was with Seniman. Coffee used to taste the same to me. The first and second cup were the same: bitter. When I had the third cup, that’s when I realized that the tastes were different and that the first and second cups were actually different. Tasting different cups of coffee within a short period of time helps me to describe their character. Then how did you finally succeed in recognizing the different flavors in coffee? Because it turns out that, if I order a specific type of coffee, say, piccolo at a café, then try another piccolo at a different café, I realized how different they are. Not to mention, if I eat or drink anything before. So tasting different cups of coffee within a short period of time helps me to describe their character. Are there other ways to help you learn the profiles? Another alternative is to bring it to a group. Sometimes, other people inspire you to notice different profiles in the drinks, something you might not noticed before. That’s why, I give a lot questions to baristas whenever I’m at a coffee shop, from the beans he chose for me to the tools he decided to use. This is also another way to appreciate them. In a cup of coffee, there are tremendous amount of stories. From the farmers who plant and sew, where they were harvested then processed, to the people who roast and brew them in vastly different ways. To me, keeping coffee plain and black is a way to appreciate this process and to truly recognize the myriad of flavors within. In a cup of coffee, there are tremendous amount of stories. From the farmers who plant and sew, where they were harvested then processed, to the people who roast and brew them in vastly different ways. According to your observations, what is the trend for coffee in our country, in the capital city, for example? It’s true that drinking coffee has become a lifestyle. It’s so easy to open a new shop because of the proliferation of this new drinking culture. Sadly, few people actually go to coffee shops to drink coffee. Most millennials are just looking for places with good interiors or exteriors for the benefit of social media content. This, would naturally impacts how people run the coffee business. In the end, these businesses have no other option but to keep up with the market. And why do you think this happened? Millennials do tend to follow trends. If the places are trendy, many will hunt those places and pay a visit. It’s the same issue when people are rushing to become baristas. The truth is, many of them are taking barista position only as a stepping stone because they’re not loyal to the business and generally owning little knowledge about the industry. If they could just learn more about the values and cultural impacts coffee has, read more about the industry and the farmers, these learnings will become so beneficial in the long run. Any message for the young generation today? will become something big for Indonesia. People just need to understand that only with integrity, they can truly educate the community. On the other hand, people need to realize where the price that customers pay should go. Now, do you feel more compelled to find stories in a cup of coffee? AULIA MEIDISKA is a writer who has worked extensively in various lifestyle magazines in Indonesia including Cosmopolitan Indonesia, HighEnd Magazine and Hellobali. Now, she spends her days as a part-time worker and content strategist while sipping one or two cups of coffee a day.